Hiding the Easter Candy and Thinking Beyond the Basket! Don’t worry, we aren’t about to suggest you forego that most favorite of all baskets ever! (Sorry, clothes baskets, you never really stood a chance.) We just have a new idea for the Easter basket that will turn Easter morning into a marathon of sorts. While it is common for the Easter Bunny to hide Easter baskets before he hops along down the bunny trail, he usually hides them with all the jelly beans and Cadbury Crème Eggs artfully arranged inside, making for a presentation you just hate to destroy but have to! 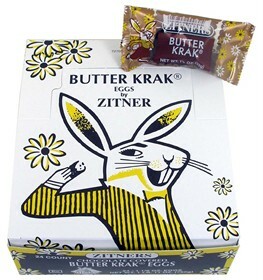 Just imagine how amazing it would feel to be able to dig into every delicious bite without destroying the Easter Bunny’s hard work. Our idea makes that possible. Instead of holding Easter candy, your Easter baskets will hold folded slips of paper – candy clues. Much like a grand finale Easter egg hunt, your kiddos will have to find every sweet piece one by one. Except perhaps the jelly beans, as they’ll need some sugary fuel to start their hunt. Plus, hiding jelly beans one by one would take weeks! Think of all the clever hiding places that exist in your home – the places a basket won’t quite fit, but a single piece of candy will. The top drawer of the computer desk, inside a coffee mug, peeking out of your purse, the options are endless! Then grab a bag of Easter basket straw, and in each of these hiding places make a small nest with a piece of Easter candy perched on top. Make note of everywhere that something has been hidden, taking care not to hide anything where a pet might be able to find it. Then get ready to write your clues! A Sweet Fashion Statement – Creating Cool Bracelets with Candy Wrappers! We don’t recommend that you try to eat all 24 candy bars in one sitting – afterward you won’t feel up for much of anything, let alone crafts! But we think it will be deliciously possible to have a new bracelet by spring, and much sooner than that if you ask friends to open their candy bars carefully and share their wrappers with you. While this is primarily a colorfully creative project, I can’t help but be reminded of a belief that many people hold – that the energy put into something becomes the energy of the end product. For example, if you angrily make a pot of soup that you didn’t really want to make, the soup might taste bad or bring about an upset stomach. Similarly, if you take something from its rightful owner, that object will bring you ill fortune one day as it is now ‘charged’ with negative energy. The good news is that energy works the other way, too! And what better positive energy resource is there than candy?! Imagine how light, bright and positively charged a bracelet will be when made from the wrappers of 24 thoroughly-enjoyed candy bars. It might just be the happiest bracelet on Earth! If a candy wrapper bracelet isn’t a style statement you’re ready to make, you can still make a difference. TerraCycle offers an upcycling program sponsored by Nestle Canada – the Chocolate Wrapper Brigade. For every empty wrapper you send in for upcycling into an ingeniously useful and fun product, including tote bags and backpacks, 2 cents will also be donated to your favorite charity. Pretty sweet! 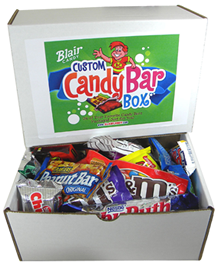 Blair Candy Announces Our New Custom Candy Bar Box! Our sugar-powered candy minds are always working overtime to think of the next sweet offering to add to our online shelves. And recently, a big idea hit us so hard that if we were piñatas there would be Tootsie Rolls flying across town! It wasn’t a candy itself that our lineup was lacking; it was a different way to buy candy that makes sense for a lot of our customers. Variety is the sugar of life, and sometimes we can’t decide between a full box of Baby Ruth Candy Bars and a full box of Butterfinger Bars. Add to the confusion that a sweet tooth on the left has put in a request for some Skittles, while the molar on the right is ready for a workout that only Milk Duds can provide! It’s an all-out candy craving war in there, and if everyone is going to be happy it’s going to mean bringing a LOT of candy into the house. Hmmm…a LOT of candy, you say? Hmmm… OK, back to the topic at hand! Sometimes a lot of candy isn’t what you’re looking for, but you do want a lot of options. And that is what Blair Candy’s Custom Candy Bar Box is all about! What is this Custom Candy Bar Box that’s blowing up the interwebs, you may ask? Only one of the funnest, most fabulous things we’ve ever rolled out! The idea is simple: for just $21.95 you get to create your own box of 24 full-sized candy favorites. As for the options, we are currently offering over 130 choices! You can double or triple up on any you like – there are no limits whatsoever to how many you choose of each particular candy. And within those 130+ offerings, there isn’t a single candy dud (except the Milk Duds, of course!). This is the candy you crave, the candy you love, the candy that has stood the test of taste and time and come out on the candy top! There are nostalgic candy choices, fresh faces on the candy market, timeless temptations, just about anything you can think of. 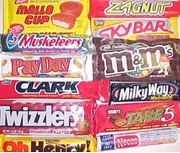 And while it is named the Custom Candy Bar Box, your choices aren’t limited to bars alone. There’s Bonomo Turkish Taffy, Bottle Caps, Sixlets, Starburst, and so much more. We think the options are limitless for our hottest new candy creation, and we hope you do too! From thoughtfully delicious birthday gifts, to pick-me-up presents for yourself and friends, this is an awesomely affordable way to bring the perfect palate-pleasing packs of pleasure to the table for less! Valentine’s Day Peeps: Perfect For Eating and Drinking! While I must admit that “Yum!” was the first thought that came to mind when the first box of Valentines Peeps rolled into Blair, the second thought was more along the lines of a chin-scratching “Hmm?” I had an idea for these heart-shaped marshmallow munchies, and I’m excited to share it with you! As if traditional sugar-coated Peeps weren’t delicious enough, the Valentines Peeps lineup features raspberry flavored marshmallow hearts coated in your choice of milk or dark chocolate. Decadent? You bet! Do I feel guilty eating more than one? Nope! These heart-shaped Peeps come but once a year, and I’m not wasting a single second counting how many I’ve managed to unwrap and make disappear! But I am not content to simply eat these sweet Peeps. Oh no, I had to find a way to drink them as well. Well…to be fair…not quite drink them whole. But add them to 2 drinks I already love to make them even tastier. And those drinks just happen to be coffee and hot cocoa. I started my Peep experiment with an oversized mug and a piping hot pot of coffee. I plunked a Valentines Peep into the bottom of the empty mug and slowly poured coffee on top, taking care not to splash. As my Peep rose to the top its chocolate coating was already melting, flavoring my coffee and sending sweet smells into the air. The slow melting of the raspberry marshmallow inside followed, lending a slight fruitiness to my drink that I quite enjoyed. When the coffee was gone, there was still some Peep left, which I promptly scooped out with a spoon and enjoyed as a finale! The rules for the cocoa were much the same, though the cocoa and Peep treat is kid-friendly as well. Just make sure not to prepare it for very young children as the softened Peep may be a choking hazard. I can’t say that even for me it was an easy task to save it for last, so I can only imagine the determination necessary for a child!